HomeExperience LevelAllKnowledge Changes – Has Yours? While we all still tell time, we don’t use sundials anymore. Discover why your knowledge must keep up. Don’t get left behind in what you know now about softball! There was a time when the Black Max was the bat to have and ghosts only came out at Halloween. It’s almost 2019 and yet we still do things we did back in the 1800’s. Things like telling time, cooking with heat, traveling in vehicles and playing softball with bats and gloves. But I think we’d all agree that HOW we do those things has changed…we have smartwatches instead of sundials, convection stoves instead of open fires, electric cars instead of horse-drawn covered wagons and ghost bats and custom gloves instead of wood bats and flat boxing-glove-like gloves. What we know now we didn’t know before and what we do now we haven’t done before. 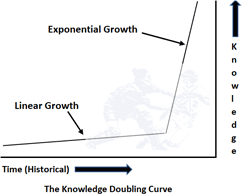 Buckminster Fuller was the first person to identify something called the “Knowledge Doubling Curve” – basically the length of time it takes for human knowledge to double. Back in the 1900’s knowledge doubled every 100 years but by the end of World War II it was doubling every 25 years! If that sounds incredible, consider this – human knowledge is now doubling at a rate of every 13 months!!! That’s only a span of 73 years for the total amount of human knowledge on the planet to go from doubling every 25 years down to basically 1 year! And get this – IBM estimates that the internet will lead to the doubling of knowledge every 12 hours!!! And yet, how much has your softball knowledge changed within the last year? Too often, we let our knowledge freeze without adding to it, or allowing it to grow. As coaches, we’re in the business of teaching people how to better play softball. If human knowledge has doubled within the last 13 months what more do you know about communication, teaching methodologies, learning science, strength and conditioning, explosive rotation techniques, defensive and/or offensive coverages, skill-specific techniques…or are you still telling time with a sundial? to hundreds of clinics across the country! One of my best take-aways from a Pitching Summit a couple years back is to be confident in what you know now, it is the best you have to offer at that time. I love to learn so I’m continually tweaking and adjusting my approaches. Sometimes I think back about how I taught something years ago and how it no longer is relevant. Therefore, I have a sense of failure for a moment, thinking I hadn’t taught my best to an athlete. But, I was my best at that time with the knowledge I had at that moment. In all honestly, it was probably what everyone was teaching at that time, so it wasn’t wrong, it was just the knowledge base for the sport at that time. It is definitely a challenge to keep up with the softball knowledge curve these days, especially with the introduction of all the new tech aids. Tremendous comment Talya!! You’ve nailed it…as long as we’re working hard to know what’s available to know right now, then we’re doing our most responsible teaching. It’s when we get lazy with what we know and we don’t grow our knowledge that we are cheating our players. You’re right about how hard it is to keep up with softball knowledge today, but that’s part of the job! Thanks again for your comments – they’re right on! !